[PDF] Moon Jerusalem & the Holy Land: Including Tel Aviv & Petra (Moon Handbooks) | Free eBooks Download - EBOOKEE! Description: This full-color guide to Jerusalem includes vibrant photos and helpful planning maps. Calls to prayer echo out over valleys and rooftops. The wailing siren for Shabbat and the ringing of church bells are omnipresent. This is a city of religious pilgrimages and a land of ancient stories, where even the bodies of water whisper of history and miracles. This is the trip of a lifetime. It will leave you with a new sense of wonderand some great stories to share. 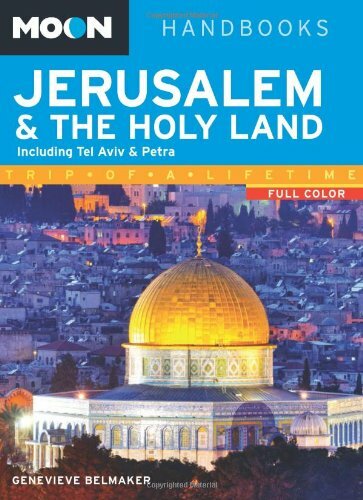 In this full-color book, expert traveler Genevieve Belmaker tells you everything you need to know to make this trip possible: How to get there, how long it will take, and where to stop along the wayincluding information on Jerusalem, Tel Aviv, Haifa, the West Bank, Eilat, and Petra, Jordan. How to choose the best tours and means of transportation, including tips on border crossings. Background on religious and cultural sites, from the Western Wall and Dome of the Rock to the Church of the Nativityand where to find them. No comments for "[PDF] Moon Jerusalem & the Holy Land: Including Tel Aviv & Petra (Moon Handbooks)".